Launched amongst much fanfare earlier this year, It's now time for AMD's Graphics CoreNext architecture to get down to serious business: driving a mainstream GPU that offers killer value at price-points which most people will end up buying. 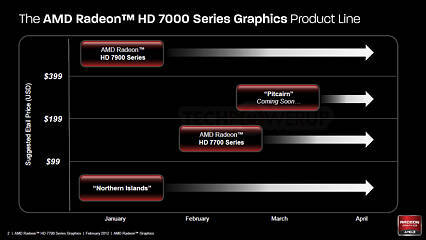 AMD today launched the Radeon HD 7700 series, based on its spanking new silicon codenamed "Cape Verde". What makes this launch a particularly monumental challenge for Graphics CoreNext is that it now has to deliver on its biggest design goal, that of being a more efficient number-cruncher than previous-generation VLIW architecture. This efficiency is supposed to show in relative performance per mm² (taking the new 28 nm fab process into account), performance per Watt, and in more layman terms, performance to stream processor count. But first, a little history lesson. AMD addressed the sub-$200 market with its first DirectX 11 generation of GPUs using the Radeon HD 5700 series, based on the 40 nm "Juniper" silicon. Since the following HD 6000 series was also based on this process, and AMD had achieved higher performance targets with "Barts", it decided to reshuffle the higher-end lineup, give Barts the HD 6800 series, and since Juniper was the only GPU smaller than Barts, re-brand it to the HD 6700 series, to everyone's disgust including ours. With the transition to the new 28 nm fab process and a new number-chomping architecture, Graphics CoreNext, designing a new GPU became inevitable for AMD. Hence, Cape Verde. 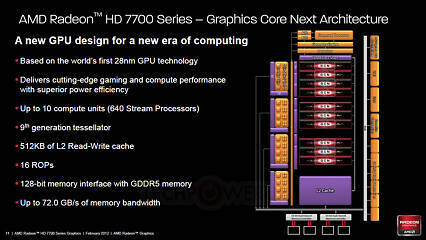 Products based on this chip, the Radeon HD 7770 and Radeon HD 7750, are touted to be true successors of the HD 6700 series. Cape Verde is a downscale from the "Tahiti" silicon, on which higher Radeon HD 7900 series parts are based. There are fewer number of redundant components, so Cape Verde is left functionally-identical to Tahiti, but is smaller, built for more affordable graphics cards. Cape Verde also retains the basic hierarchy of the architecture as implemented in Tahiti. A command processor takes input from the host machine, decodes them, and does the groundwork for the number-crunching area, the Graphics CoreNext clusters, which then perform all the shader and math-intensive processing. The Raster Operations area does the final leg of the processing, and the information is forwarded to the display logic. All components are interconnected to an L2 cache, that works as a very fast scratchpad for the GPU, and of course, the memory controllers. Cape Verde has 10 Graphics CoreNext Computing Units (GCN CUs), which total up 640 stream processors. The chip has 40 TMUs, and 16 ROPs. It features a 128-bit wide GDDR5 memory interface, with which it communicates with 1 GB of memory. The chip retains the display logic of Tahiti, which lets you connect up to 6 displays in Eyefinity for productivity usage. The GPU also features PCI-Express Gen. 3.0 support, which increases bandwidth between it and the rest of the system. While we doubt the chip really needs 32 GB/s of system bandwidth, PCIe Gen 3.0 could come handy when connected in configurations with lower number of PCIe lanes (such as x8, x4, or even x1), as PCIe Gen 3.0 has more bandwidth per lane. 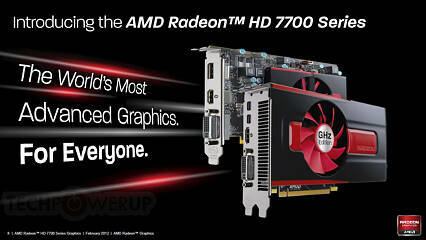 With the new HD 7000 series, AMD also introduced what it refers to as ZeroCore Technology. Simply put, this feature reduces power consumption of the GPU down to zero, by gating power to it, when the system is idling for extended periods of time, when the displays are blanked. In this power state, the graphics card draws less than 3W of power, making it extremely energy-efficient. 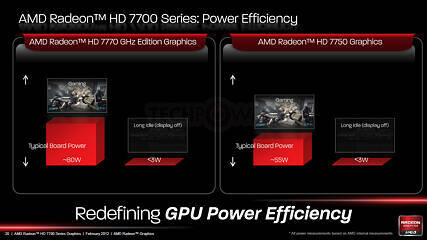 The typical board power figures for the Radeon HD 7700 GPUs are also claimed by its makers to be extremely low. 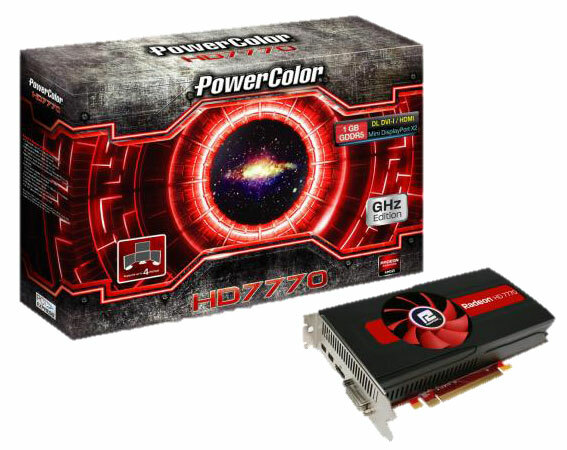 PowerColor sent us a card that is pretty much identical to the AMD reference design. Only the cooler has undergone very minor changes on the outside. Its internals are the same as on the AMD board, clock speeds are also at reference design level.